We designed a new style of magnetic fish, shiny but flexible and lays flat. 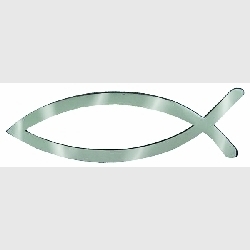 Magnetic Christian Fish Emblem - The fish is a sign that Christians have used throughout history. Durable and flexible shiny chrome finish over vinyl magnetic material, fish emblems are the perfect witnessing tool on your automobile. Shiny fade-resistant foil finish on top of .035" magnetic vinyl, so it is somewhat flexible in case there is a slight curve on your vehicle. This Fish emblem is 5 1/4" x 1 1/2" and attaches to any mostly flat metallic surface without adhesive. This is not made of metal but of a high quality UV resistent foil finish on vinyl. This exclusive SupportStore shiny fish magnet ships inside a larger rectangular piece of magnet to keep it in perfect condition. When ready for use, gently remove it from the surrounding magnetic material. The middle piece has a second chrome finish fish shape in case you wish to use that as well. Suggested alternative: This style has the shiny foil like surface, that looks like chrome. We also have a silver fish magnet that is flatter with a flat finish and looks great on cars but is easily removed. See the link below to the Christian Fish Magnet Silver, or for an actual metal fish see the Chrome Emblem version. Most retailers will sell the Christian fish emblem with an adhesive backing, making it pretty permanent. I was pleased to find a magnetic fish that can be removed for car washing. Each time I remove it, I switch sides of the rear of the car for replacement. The first one I purchased lasted easily 2 years. Given the price, that isn't unreasonable. I decided this time to purchase two in order to have one in reserve. A good value and a safe way to protect your car finish while professing your faith! By more and share with your friends!